Is that serger sitting in the corner of your studio, gathering dust? It can be a great help during the gift-making season, particularly with challenging fabrics. One such fabric is the very lovely jacquard wax batik from Ghana (I met Lisa from Cultured Expressions at a conference…check her online store for some amazing fabric). I had purchased a sampler pack of assorted 7″ squares, and filed it away in that use-someday part of my stash (I bet you have one, too?). The fabric is very silky – read: slippery…and a looser weave than quilters’ cottons. Bernina serger to the rescue! I threaded it with cones of black thread (this was the most time-consuming part of the project 🙄…), then serged rows of squares in a mostly-random fashion. Placing the rows on my design wall, I arranged to ensure variation of these lovely colors, and serged the towns together. I didn’t worry about matching points here, a bit of wonkiness adds to the charm. Done. About one half-hour (NOT including threading). 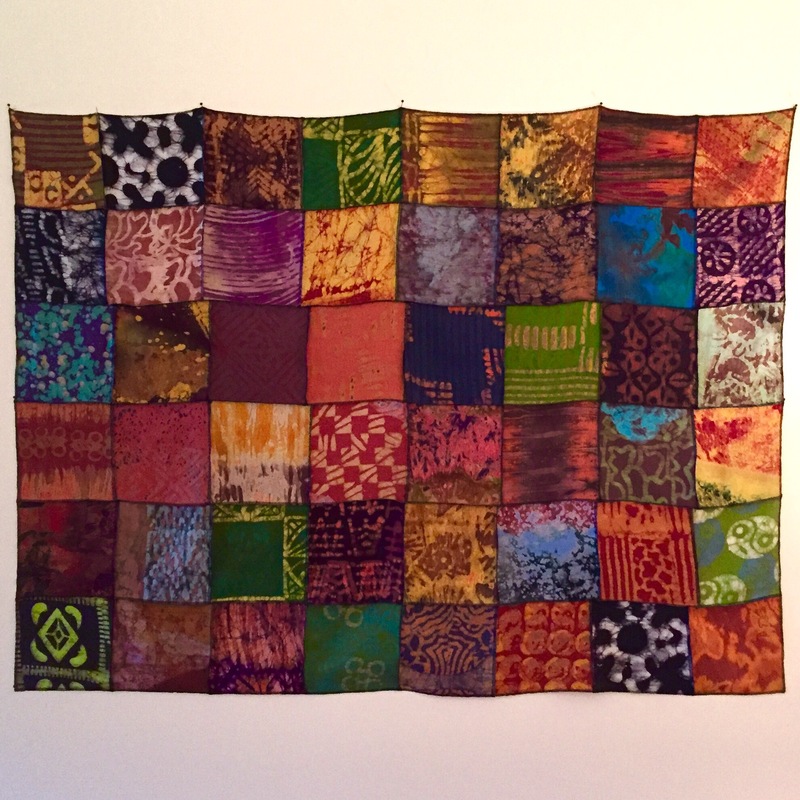 A perfect wall-hanging that requires no quilting…there is so much variation in texture in the fabric squares that there is plenty of surface interest. Of course, I then made single rows in long enough strips to give as scarves, too. Tomorrow, the adventures of the serger continue with another scarf idea :). What have YOU created with your serger? This entry was posted in Uncategorized on December 11, 2015 by neonkittyquilts.